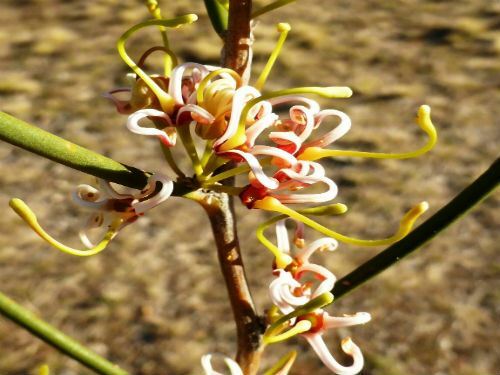 Hakea platysperma, the Cricket Ball Hakea, is a single stemmed spreading shrub reaching a height of 2-3 metres. The leaves are thick, circular in cross section (terete), up to 12 centimetres long, rigid and sharply pointed. The flowers are held in axillary clusters with 1-7 flowers. They are carried on both old and new wood. Blooms are cream or slightly reddish, said to be sweetly perfumed and with long, yellowish styles. Honeyeaters are attracted to the flowers as are native wasps. Cultivated plants in USA attract hummingbirds to the blooms. The woody fruits are the eye-catching feature of this species. They are globular, up to seven centimetres in diameter and hold two circular seeds about three centimetres in diameter. The common name is an apt description. A description of the fruit in 1842 likens them to castanets. H. platysperma occurs in the botanically rich southwest corner of Western Australia. The species name comes from platys, Greek for broad and sperma, Greek for seed, referring to the large round seed of this species.